But there is one thing that put me off in the beginning, and one tip I learned early on to solve the problem. What problem? The greasy feeling and difficulty spreading the oil on my face. I really didn't like applying it at first, because the oil wasn't being absorbed by my skin very well, I had to massage and rub it in forever, and my hands were left feeling slippery and greasy. And, of course, my face looked like fried chicken - quite unpleasant. That's the word really, I initially found the use of facial oils unpleasant. Luckily I quickly learned a little trick that, although it can't make oil feel oil-free, makes application a lot easier and more enjoyable. Have you considered using face oils but given up because the idea of smearing oil on your face sounds uncomfortable? Or do you already use face oil, but dislike that part of your daily routine? Keep reading to find out about the easy fix! Apply your face oil to damp skin! Just try it out and feel the difference: the oil will be a lot easier to spread, the amount of rubbing needed will decrease dramatically, your face will be a lot less shiny, and your hands feel a lot less greasy. You'll even use less of your oil, making your bottle last longer, for potentially better results on your skin, since it will be applied to your face more evenly. Your face shouldn't be so wet that it's dripping, just slightly damp. You may need to experiment a few times to find the right level of dampness. By applying oil on top of water and rubbing, you're basically creating an emulsion. An emulsion is a mixture of water and oil. Yes, you may remember from early chemistry classes that oil is not soluble in water, so when you mix them together (using my tip, making a vinaigrette, shaking a bi-phase makeup remover, etc) you actually get microscopic droplets of oil suspended in water. Most face and body creams are actually emulsions, made stable by the use of surfactants that keep the oil and the water from separating. So by applying your face oil to damp skin, you're basically turning it into... a face lotion! It glides a lot better, and it's absorbed a lot faster too, while preserving the specific properties of your oil. Of course it works if you just dampen your face with tap water. But tap water is often drying, especially when it's hard, because it's usually treated with chlorine. You'll be better off using skin-friendly water, such as a mineral water spray. 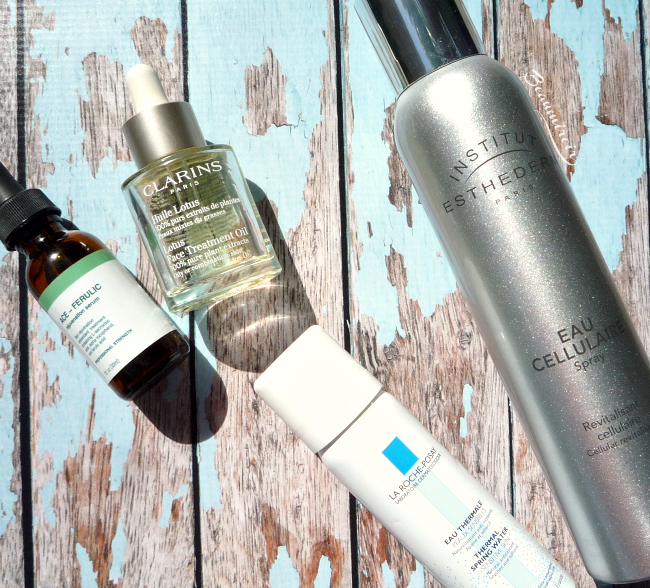 There are many to choose from, most of them by French brands: Evian works for everyone, La Roche-Posay and Avène are great for sensitive skins, and my personal favorite is the Cellular Water by Institut Esthederm. As a bonus, these waters will bring beneficial minerals, moisture, and, in the case of the Cellular Water, nutrients to your skin. Another option would be to use a floral water, such as rose water (just make sure it's pure and produced by distillation, not just purified water scented with rose oil. This one is legit). You could even use your favorite toner or essence, as long as it doesn't contain alcohol! 1- Remove makeup and cleanse skin thoroughly. 2- Spray your choice of mineral water to your face to get your skin slightly damp. 3- Get a few drops of your face oil in the palm of one hand, and rub both together. 4- Press hands on face, then swipe gently to spread oil evenly until absorbed. 5- Continue with the rest of your skincare routine. 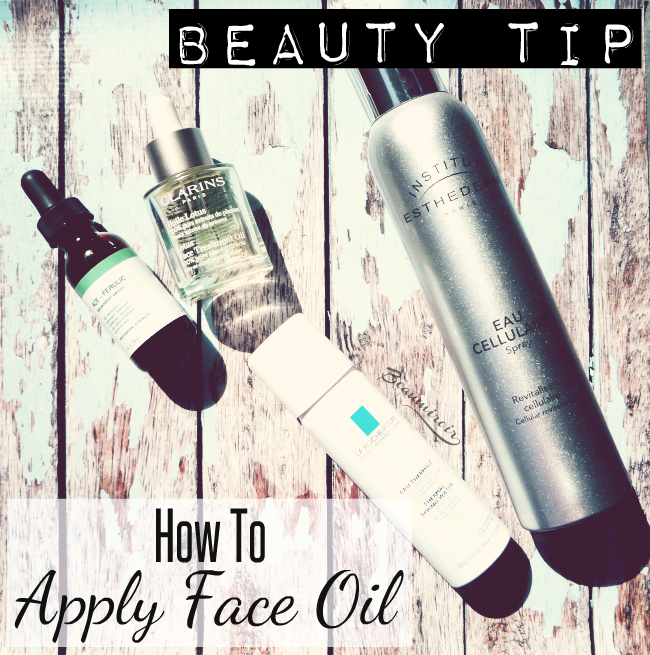 Do you use face oil regularly? Did you know about this little trick? The products featured in this review was purchased by Lulle, with the exception of Institut Esthederm Cellular Water which was sent by the brand's PR for consideration. I received no compensation to write this post, which only reflects my personal opinion. This post contains affiliate links.